The BrushMaster® was specifically developed to clear property quickly – up to 5 times faster than other commercial mowers. 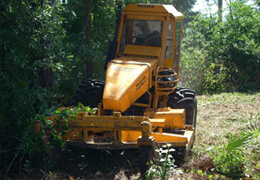 The commerical mower leaves an attractive appearance to the land while retaining trees larger than 4" in diameter. 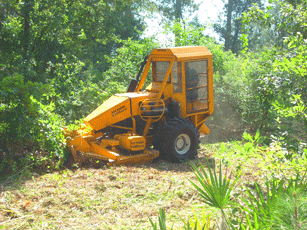 This machine cuts differently from our slope mowing machines. 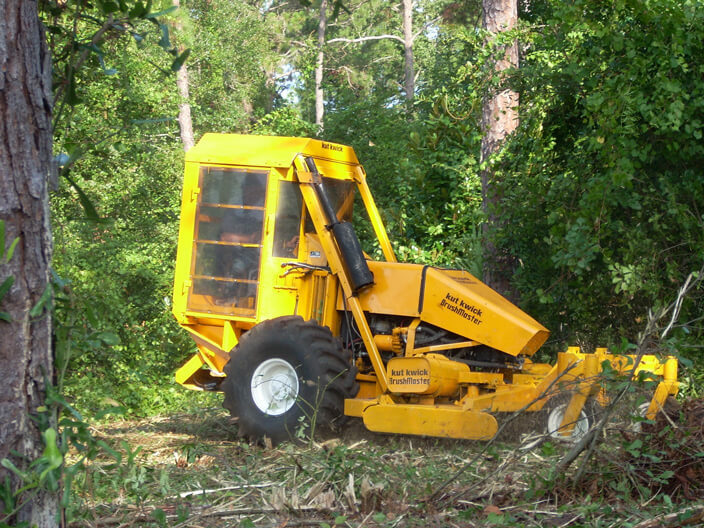 The land clearing BrushMaster pushes brush and trees forward cutting everything close to the ground then runs over the cut materials, recutting them into small clippings that pass through the rear discharge cutting deck. The clippings are left flat on the ground where they quickly deteriorate and fertilize the soil. 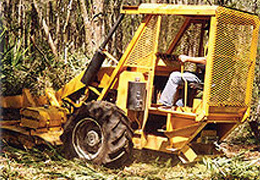 It also works on slopes up to 32° and comes standard with a powerful 72 HP Yanmar, liquid-cooled diesel engine driving three hydraulic blade drive motors and dual hydro-static transmissions that allow the zero turn capability that is so necessary for efficient clearing. 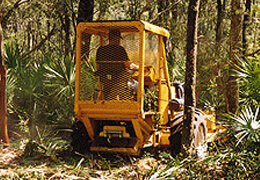 The 88" front mount, triple blade, rotary deck clears everything in its path, making this machine perfect for right of ways, parks, trails, survey lines, wildland-urban interface areas and the removal of brush. This slope mower is so reliable that it is supported by a one year warranty. For highest efficiency, lowest labor, minimum maintenance and longest life – get the BRUSHMASTER®! 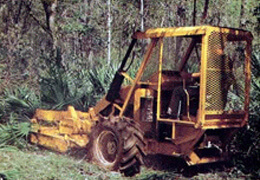 The cut material mats the forest floor making it passable for vehicles to travel over cut areas, which is an advantage over plowed areas. 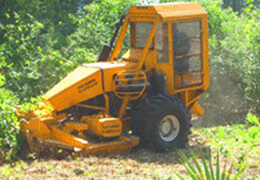 The root structure of trees and other plant life is not damaged by the BrushMaster. Root damage is the primary reason for erosion after prescribed burning and/or plowings. New growth is not readily flammable for about one year. Animals and birds can get to the ground to feed. They are attracted to and thrive in areas cut by the BrushMaster. 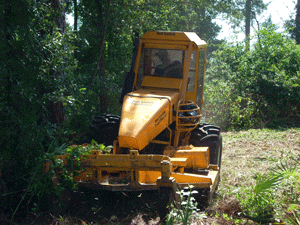 One of the most important results of clearing with the BrushMaster is land beautification. The appreciative public response to the beautification is of immeasurable value to the government agency that has done the work. 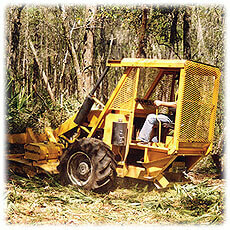 Clears land quickly and efficiently! 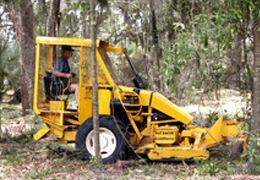 Cuts down everything except desirable trees over 4” in diameter - cutting all brush into small clippings that lay flat on the ground for appearances, leading to rapid decomposition. - A recirculating closed system air conditioner to protect the operator from smoke and other contaminents. - Cab protection enclosure must be purchased for the air conditioning upgrade. Lexan sheeting covered by metal guarding replaces the screens from the cab protection enclosure.